Teacher absence is expensive. With 5.3 percent of teachers absent on a given day, stipends for substitute teachers and associated administrative costs amount to $4 billion, annually. Teacher absence negatively affects student achievement. Researchers have found that every 10 absences lowers mathematics achievement by the same amount as having a teacher with one year to two years of experience instead of a teacher with three years to five years of experience. 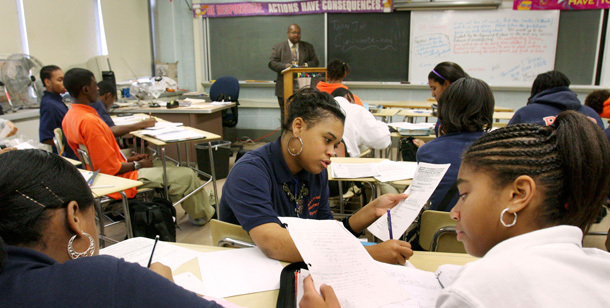 Teacher absence disproportionately affects low-income students. Students in schools serving predominantly low-income families experience teacher absence at higher rates than students in more affluent communities. Part of the achievement gap is thus due to a teacher attendance gap. This report provides new analyses of data from an anonymous, large, urban school district in the northern United States. The data include dates and “excuse” codes for 130,747 absences taken by 5,189 teachers in 106 schools over four years. Patterns teased from the data put the spotlight on discretionary absences—those due to personal days or short-term illnesses. Discretionary absences comprise 56 percent of all absences and tend to occur on days adjacent to non-instructional days, such as weekends. This suggests that teachers have room to respond to incentives that discourage avoidable absences and encourage excellent attendance. Analyses of the data corroborates previously documented relationships between absence and observed characteristics of teachers, such as gender, experience, tenure, and commuting distance, as well as school characteristics such as enrollment, grade configuration, and average student attendance rate. The data also create profiles of average teacher absence behavior for each of the 106 schools. The profiles share an underlying seasonal trend, with rates of discretionary absence rising from September to December, falling until February, and then rising again to their highest levels in June. Differences between profiles show that schools operating in the same policy jurisdiction can have surprisingly different absence profiles, even after accounting for characteristics of teachers in the schools. This suggests that absence culture—the building-level professional norms around absence—may merit future study. A typology of absence culture and a well-known description of how new teachers’ moods change over the course of a school year furnish vocabulary that can facilitate further inquiry by researchers. Federal policymakers should amend No Child Left Behind to require information on teacher absence on school report cards. School districts already collect data on teacher absences, and sharing it publicly—already the practice in some states—will give parents a more nuanced picture of school quality. State policymakers should re-examine and justify statutes governing teachers’ leave privileges. Not enough is known about the appropriate level of leave privileges. Those in some states may be excessively generous, elevating rates of absence and incurring the financial liability of accumulated, unused leave. This liability represents a source of leverage for reducing privileges, where needed. Local policymakers should encourage experimentation with and evaluation of incentive policies designed to reduce levels of teacher absence. Many examples of such policies exist, and teachers respond to them. However, little is known about the optimal characteristics of bonus schemes, buy-back provisions, or co-payment programs. Teachers’ presence in school is a fundamental prerequisite of student success. Some teacher absence cannot be avoided, but patterns of absence like those documented in this report suggest that students’ exposure to teacher absence can be reduced. These recommendations give policymakers at every level an entry point toward better understanding this issue, prompting researchers to generate new, relevant knowledge informing the re-allocation of existing resources in ways that better meet the combined needs of teachers and their students.